. . . . . . . 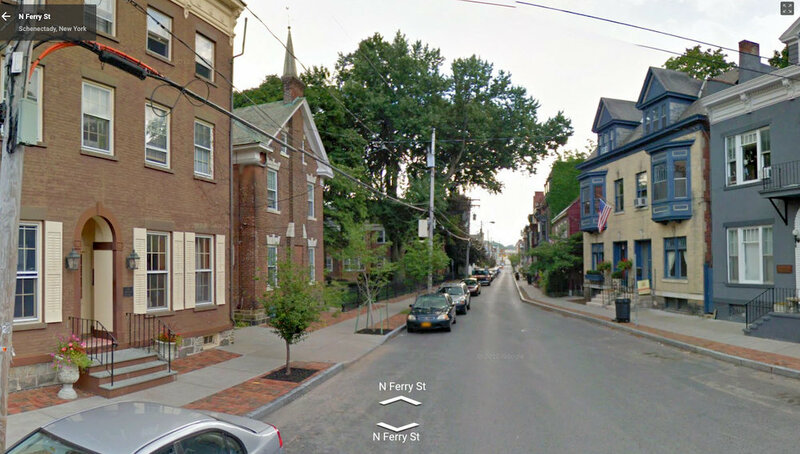 Welcome to the web portal for S.O.S.Trees: the Save Our Schenectady Trees Project. The initial meeting of SOS Trees was held on Saturday, April 30, 2016. Click for the Meeting Announcement. A summary of that meeting, with a handful of photos, and printable versions of much of the materials used at the meeting, can be found in the posting “the day after Arbor Day”. follow-up (March 12, 2019): Passage of the City’s new Sidewalk Assessment District resolution, which promotes fixing sidewalks with City-owner involvement a block at a time, again raises concerns of losing many street shade trees under the City Engineer’s root-cutting criteria, as happened in 2008 on No. Ferry Street. (See Times Union article, March 12, 2019). Below: No. Ferry St. scene in 2007 [L] and 2011 [R] after trees removed during sidewalk replacement (photos by Google Maps Street Views). The large trees in the center of the R image were on private property and originally saved. But. they were later removed or significantly trimmed along the sidewalk by the property owner, St. George’s Episcopal Church, for fear of liability for falling limbs, leaving a block with virtually no shade. It has once again become urgent that we work to create a Tree Preservation Policy for Schenectady, so that trees in the City’s right of way (between the curb and sidewalk, and in medians) are preserved, unless an individual tree is dead, dying or dangerous. That means that alternatives to tree removal must be employed, except where there is no viable alternative. The issue arose again publicly for many of us in 2010, when the City threatened to take down all mature trees along Washington Avenue when repaving it and replacing its sidewalks. A combination of resident opposition and strong Schenectady Gazette editorials (see here and here) prevented this unwarranted attack on a valuable portion of our urban forest, and the beauty and history it embodies. After that first crisis, the repaving of Washington Avenue was delayed four years, and sidewalk repair was indefinitely postponed. 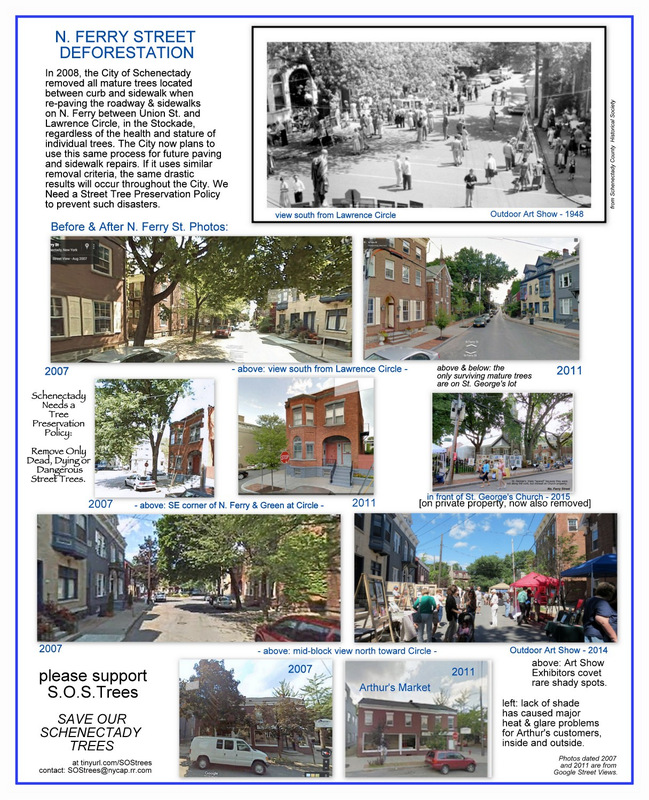 This website was, in fact, created in a rush in June 2010, in response to the threat to the trees on Washington Avenue, under the name Save Our Stockade Trees. Although the site is now focused more broadly on Schenectady issues and called “Snowmen at the Gates”, the tree-preservation materials are still available, with the “Save Our Trees” tab on the masthead leading to this webpage, which serves as a portal into the topic. We hope public outcry, combined with serious research, consideration, consensus-building and proposals to solve the problem, will again be able to Save Our Schenectady Trees, and guarantee their future preservation. What is it worth in dollars, environmental, social, and economic benefits, civic pride, and aesthetic pleasure for residents, visitors, and tourists, to save our street trees? Shouldn’t we take the time to seriously consider the options available to us other than virtual clear-cutting, before needlessly taking down a tree that is not dead, dying, or dangerous, in the name of “streetscape improvement” or liability avoidance? 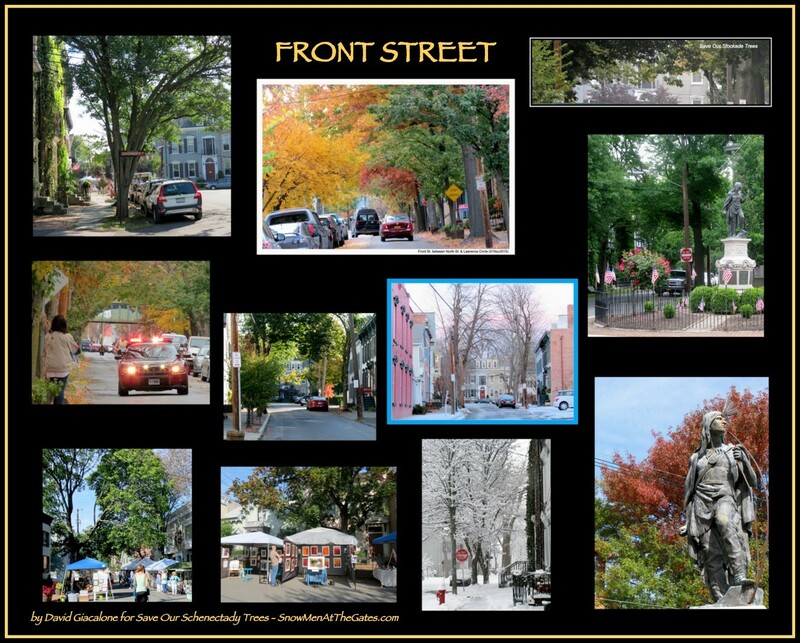 For a full introduction to the issues and alternatives, see our updated posting from 2010, “Schenectady needs a Tree Preservation Policy”, and its appendices, which include photo collages of trees we would hate to lose. 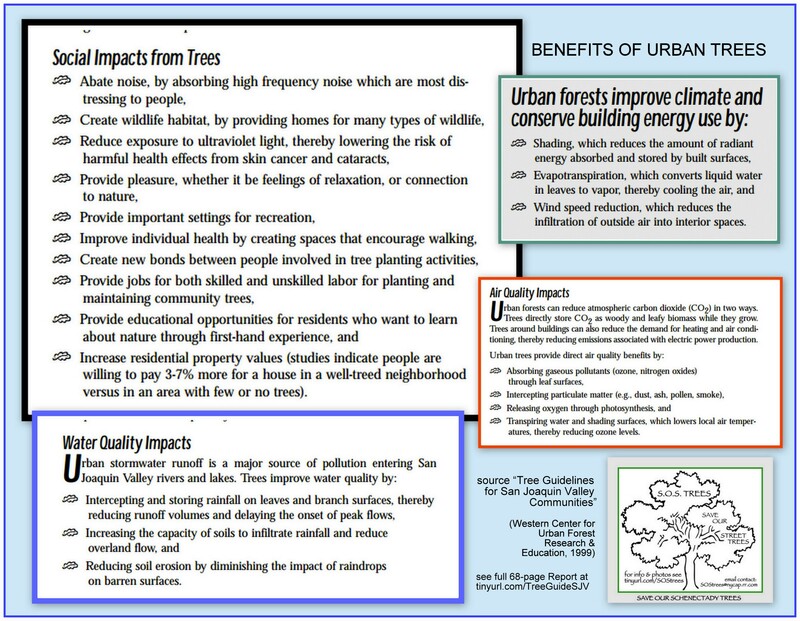 The BENEFITS of a healthy urban forest are many – aesthetic, social, economic, environmental, safety, health, etc. There are many useful sources; for example, see the Tree Benefits section of the American Forests website; and the detailed study and plain-English report “Tree Guidelines for San Joaquin Valley Communities” (Western Center for Urban Forest Research and Education, 1999). Click on the collage to the right of this bullet point for a compilation of benefit lists found in the SJV Report. BIG TREES ARE SPECIAL: Also, see “why worry about our large street trees?,” which gives the S.O.S. Trees perspective on what we have to lose by deforestation of our urban street trees (whether intentional or not), especially in our historic districts and older neighborhoods, and argues that size matters. MANY ALTERNATIVES EXIST: The post “sidewalks vs. trees” presents quotes from reports, laws, and groups that favor preserving our trees when repairing sidewalks, and discusses alternative ways to repair sidewalks without removing the nearby trees. 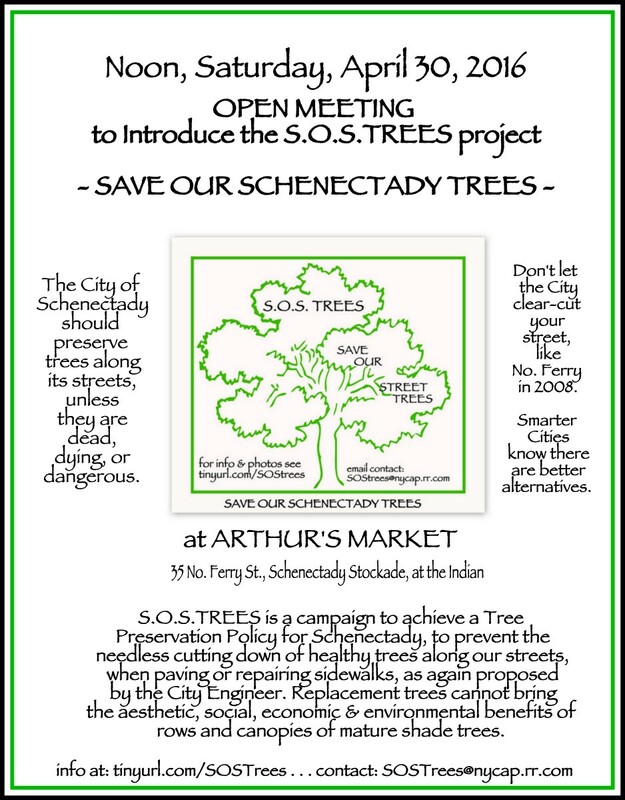 Thanks to the Schenectady Gazette opinion staff for printing “Save our healthy old trees” [pdf. file] as a Guest Column, Sunday, April 24, 2016, D1. And, see Sara Foss’ column, “Finding ways to save urban trees worth the effort” (Daily Gazette, May 19, 2016). Click this link to see all postings in our Save Our Trees Category, from the most recent back to the first battle in 2010. For a direct comparison of the N. Ferry Street streetscape before its “improvement” in 2008 with its current condition, see “N. Ferry St. then and now” (April 22, 2016). This Stockade street tree wasn’t dead, dying or dangerous. Click here for its story. We believe that neither the City nor individual property owners should be allowed to remove a mature street tree unless it is dead, dying or dangerous and there are no other viable options. 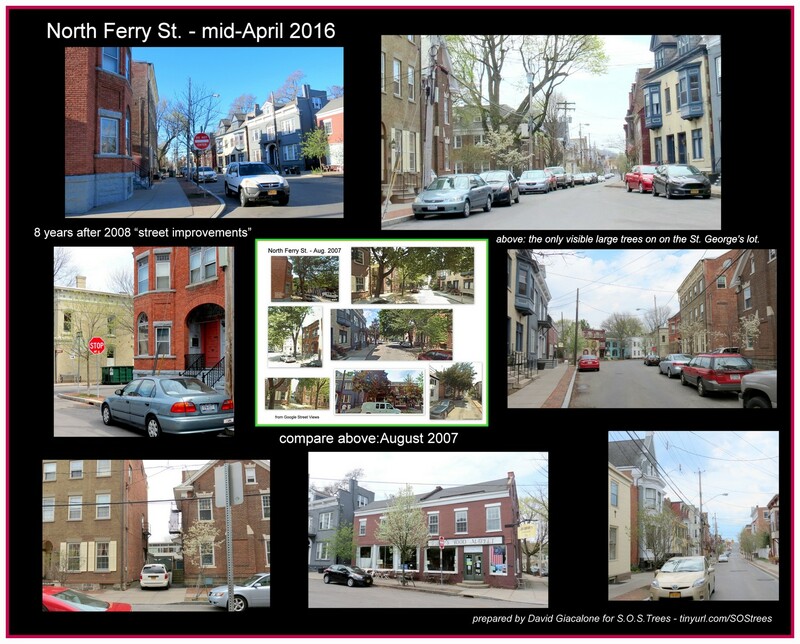 . . below are just some of the street trees we need to protect; find more here: photo collages . Please Note: I’ve started with Stockade photos and streets, because my photography has always focused on that neighborhood, where I have lived since moving to Schenectady in 1988. (see my photo-blog “suns along the Mohawk“) Our goal, of course, is to preserve our Legacy of Trees throughout Schenectady’s neighborhoods, and to win support in our entire community. I hope to present “what we have to lose” collages at this site from many other neighborhoods. If you would like to help create a Street View Treescape Collection, please contact me directly or by leaving a comment. WANT TO DO MORE? : If you would like to take an active part in this Tree Preservation project, please contact David Giacalone directly, or email SOSTrees@nycap.rr.com. Thank you.